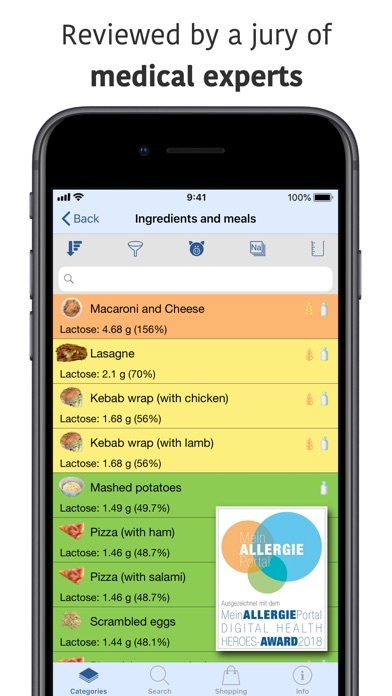 The app Food Intolerances is a tool to help everyone who has to stick to a restricted diet because of food intolerances or allergies. 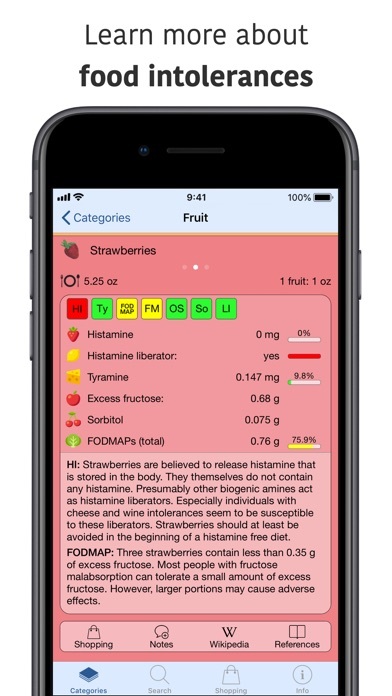 Typical application cases are: histamine intolerance, mastocytosis, fructose malabsorption, sorbitol intolerance, aspirin intolerance, gluten sensitivity, lactose intolerance or a diet low in FODMAPs. The app was reviewed and evaluated by a medical jury and was awarded with the Digital Health Heroes Award 2018. * It contains more than 900 foods that are commented and rated in view of the following subjects: - Carbohydrate malabsorptions • Fructose • Lactose • Sorbitol and other sugar alcohols • Oligosaccharides (e.g. fructans and galactans) • FODMAPs (total) • Sucrose - Histamine intolerance • Histamine content • Tyramine content • Histamine liberators and DAO inhibitors • Problematic medicines • Food additives - Salicylate intolerance • Salicylate content • Problematic food additives - Other intolerances and allergies Filters for gluten, wheat, soy, yeast, sulfites, dairy, egg, fish, meat, pork, beef and honey - More features • Detailed info texts • Flexibly adjustable rating system • Filter function • Sorting function • Possibility to write notes and manually adjust the rating • Adjustable portion size • Shopping list • Blog • Direct link to Wikipedia articles • No internet connection required - Nutrition facts (in-app purchase) • General nutrition facts (e.g. energy, protein, salt, omega-3, ...) • Minerals and micronutrients (e.g. iron, zinc, calcium, magnesium, ...) • Vitamins A to K • Recommended daily intake • Glycemic index and glycemic load • Nickel allergy and nickel content • Sort foods by nutrition values (works in combination with the filter function) * http://www.baliza.de/blog/files/histamin-health-heroes-award.html ** This app doesn’t rate brand specific products, but common foods and basic food categories. It provides you with all the information needed to deal with your intolerance and to avoid common mistakes. +++++++++++++++++++++++++++++++++++ The app does not replace medical care and should not be used for diagnostic purposes. While the information provided here has been compiled to the best knowledge of the author, mistakes happen, since it is a complex matter, which depends closely on the individual person. We are constantly working to improve the app, but information may be wrong and may even contain harmful recommendations. The Baliza GmbH disclaims any liability as a developer of this app for the accuracy, completeness and timeliness of the information and any resulting damages, consequential damages and other disadvantages. The assertion of claims of any kind is excluded. No way to report errors? Re: Olive Oil is very high in Salicylate according to many sources. Would rate it much higher but the app says that olive oil is low in Salicylate which most articles online say is actually very high. Many people get sick from olive oil. If the programmers fixed that error, had a way for us to submit a report, or would explain why they think it is not high, I would change my rating. Hope that this is the only possible mistake. Edit: I forgot to mention how helpful it is to have all the info re the different intolerances. I’ve learned a lot thru this app. 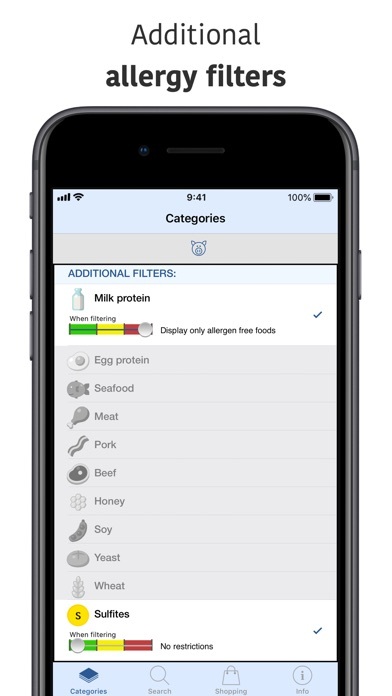 This app has been very helpful as we have been learning about and trying to navigate multiple food intolerances. Thanks! 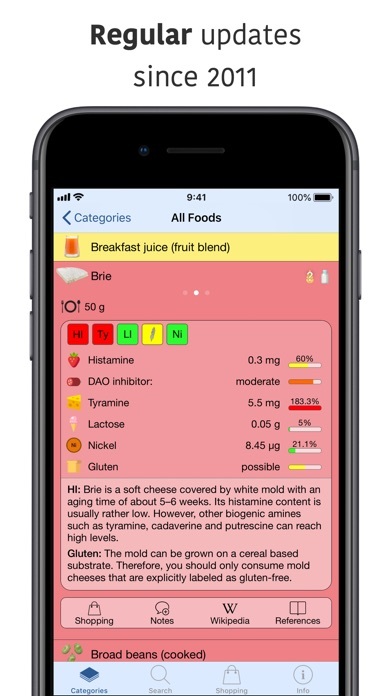 Your app claims that avocado doesn’t have histamine but actually avocado is high in histamine. How do I get a refund? I, paid for it today and took one look and decided I don’t need this app. Great app so far! One question, in the info section it mentions there's a fructose to glucose ratio, but when searching for a food, I don't see it. For example banana chips, shows sucrose in grams and %, and free fructose, but I'm not seeing a glucose ratio? Please help! I’m having trouble navigating this app. How do I adjust my food intolerance? Is there no way to record what I have actually eaten and symptoms? This is a wonderful app. The information and reference links are extensive. I like it’s flexibility to tailor to my specific needs. 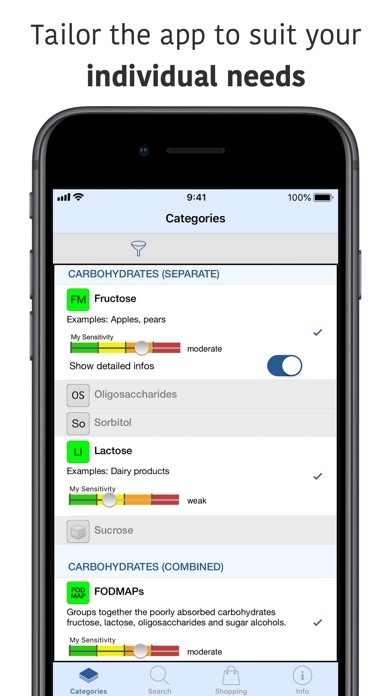 I set it up to track FODMAPS, gluten, lactose, Vitamin K, fiber, and manganese. I was able to find all the cheeses that have no or very little lactose. I also found that the fruits and mushrooms I was eating every day are not acceptable for FODMAP restrictions. One request: could you add a setting to track foods that help and hurt my campaign against inflammation. Keep up the good work! New updates have made some foods high in salicylates as green. Misleading This app is wonderful! Every update has been wonderful but notice a few foods missing. One is plain corn and corn on the cob. They have corn salad......don't even know what that is. Greens (collards, turnip etc) missing as well. I would also like information on medicinal herbs like milk thistle, ashwagandha, St. John's Wort etc. I find conflicting information on the web. Every food intolerance imaginable is listed as well as other allergies. Great app. Good app, but why does it cost more? When the app already costs $4.99 in the App Store, why are you charging for the nutrient information additionally? You really shouldn’t charge more for that information. The app doesn’t contain enough useful information to warrant the price —then the addition of some nutrients doesn’t really warrant an extra fee.